Have you ever had one of those gut wrenching moments in your life, in your business or on the stage where it felt like everything failed? 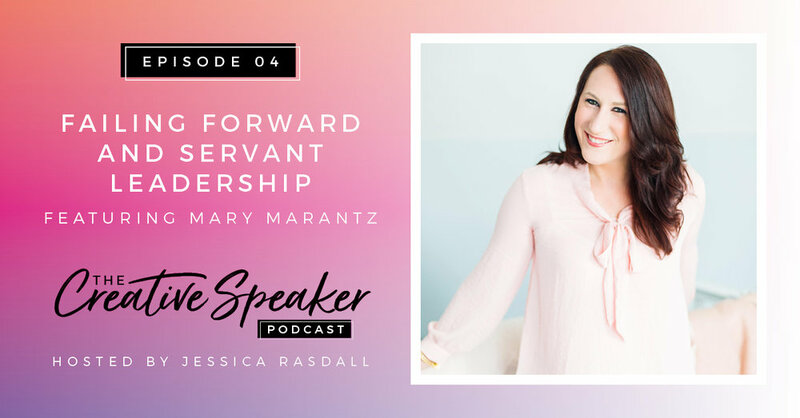 And all you could do was ask yourself, “What on earth do I do next and how do I pick up the pieces?” In today’s episode, I am chatting with my dear friend, Mary Marantz about that exact moment in her life and how she moved forward! This grand speaking platform wasn’t handed to Mary. She had to work hard for it to happen and be successful! And through that she has learned the value of servant leadership in the world of speaking. Mary Marantz works alongside her husband, Justin, as international wedding photographers. They travel the globe to photograph weddings, as well as teach and inspire small business owners to really just bring their best selves to the table. Mary has not only spoken at several conferences, but has hosted some as well. There will be times where you apply to speak somewhere and you don’t get picked, but that is not a failure. The true heart of failure is not just falling on your face, it is falling on your face when the people you love most are watching. When you see somebody who has built a successful business and is delivering these powerful presentations, don’t forget that it didn't always start that way and it wasn't always pretty. We think that there's just a magic trick out there and once we get that the success is just instant. But we don't want to put in the work, serve people without the recognition, and don't want to show up and roll up our sleeves and invest in what it takes to reach success. You have to be willing to put yourself out there and if somebody gives you a chance, never think that it's too small. You may not believe you have a story that can impact people, but you have a purpose.